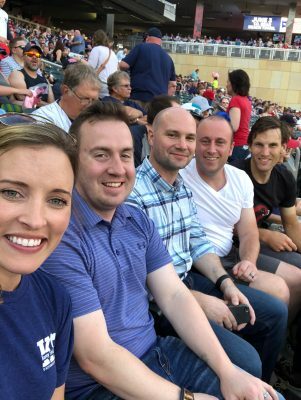 The American College of Sports Medicine (ACSM) Annual Meeting was held in Minneapolis from May 29 – June 2. Most of the KSI staff attended this outstanding conference and they were honored with the opportunities to present their research. We had great discussions with other attendees and received feedback for future work via these presentations. 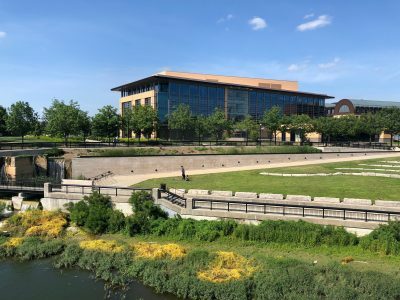 Attending this conference allows the KSI staff to obtain further knowledge, skills and new ideas as well as make new relationships with other professionals. This conference certainly helps to develop KSI and execute our goals to maximize performance, optimize safety and prevent sudden death for the athlete, soldier and laborer. The KSI staff members are thankful to all of the presenters and attendees for their contributions to this field as well as helping make this conference one where individuals who are passionate about similar topics can meet, collaborate, and enjoy one another. 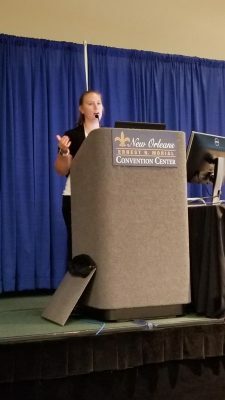 During the last week of June, a majority of the KSI staff traveled to the “Big Easy” for the 69thannual National Athletic Trainers’ Association Clinical Symposia. New Orleans may have been ready for us, but we sure weren’t ready to face the very hot and humid days. 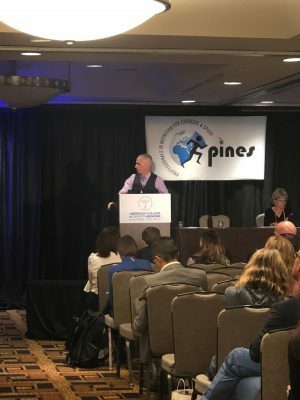 Despite the sweltering weather, this year’s conference was filled with presentations and meetings that not only showcased the numerous projects KSI is actively engaged in, but also served as a platform to continue our mission of optimizing safety and preventing sudden death in sport. The week kicked off with our Medical & Science Advisory Board Meeting at one of Dr. Casa’s favorite restaurants – Bubba Gump Shrimp Co. We were very thankful to have so many familiar faces in the room, and even saw a little competitiveness come out in a friendly game of Bubba Gump Trivia. Following dinner and a lot of laughs, Dr. Casa spoke to the Board regarding the recent accomplishments of KSI, especially three primary initiatives that have been the focus over the last couple years: (1) the ‘Raise Your Rank Campaign’, a state-specific approach aimed at improving mandated best practices policies to reduce catastrophic injuries in sport, (2) the Athletic Training Locations and Services (ATLAS) database, which has now officially mapped the extent of athletic trainer services provided to every public and private secondary schoolacross the United States, and (3) the Perceptions of Athletic Training study, which is currently assessing perceptions of the profession from athletic directors, principals, superintendents, legislators, coaches, and parents in order to develop educational strategies to further raise awareness of the value of the athletic training profession. 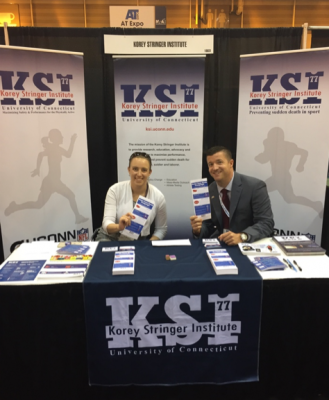 In addition to the presentations, our staff enjoyed manning the KSI booth at the NATA Expo. We love when people stop by; even if it’s to tell us a personal story, talk to us about one of our presentations they attended, or reach out to us as a resource for whatever circumstance they may be encountering in their current clinical position or state. 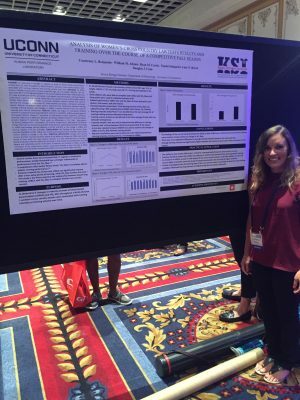 Every year we have more attendees stop by and share with us how they’ve heard about KSI or thank us for the work we do to improve health and safety for student-athletes. It really is the biggest motivation to continue our mission day after day. 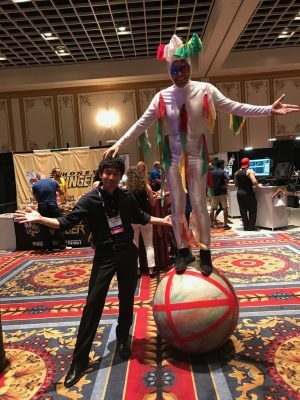 The 2018 conference was a unique one for KSI, since we also held two separate events to raise awareness and support initiatives we are currently engaged in. The first was a ‘launch event’ for the Comprehensive Safety Initiative (CSI), a collaborative effort between KSI, University of Connecticut, University of North Carolina at Chapel Hill, and Player’s Health, to help secondary school athletic trainers identify areas for improvement related to health and safety best practice adoption. A comprehensive library of resources will be accessible on the Player’s Health platform by the end of 2018. All secondary school athletic trainers are encouraged to complete the Safety Needs Assessment located at: assessment.playershealth.com. The second event was held for all athletic trainers currently employed at high schools who were recipients of the NFL Athletic Trainer Pilot Grant, an initiative aimed at providing secondary schools with resources to start or enhance their athletic training programs. June 2018 marked the end of year one of the pilot grant program, so we invited the athletic trainers currently employed at these schools to attend the meeting, provide them with more detailed information related to the grant program, but more importantly, debrief about their first year and offer as much support to them as possible. The meeting was a success, and not only gave us the chance to meet the athletic trainers in person, but also served as a platform to receive valuable feedback to improve the program in the next two pilot years. Now the conference really can’t be all work and no play…when in New Orleans, do as the New Orleaners do! We were very fortunate to have our own personal tour of the city from a KSI benefactor, massive supporter, and close friend of Dr. Casa’s, Scott Chafin. Scott, along with colleagues from his law firm, brought us around NOLA for four hours of unforgettable fun. From the Garden District, to an amazing seafood dinner, followed by authentic Italian dessert, and of course, some trolley karaoke, it was a night we are forever thankful for and will never forget. It was a very busy, yet rewarding week, and the perfect opportunity to share the work of KSI with athletic trainers across the country. Perhaps my favorite quote of all time is “Alone we can do so little; together we can do so much,” and this year’s conference truly made me realize how muchwe’ve done and how muchwe will continue to do. I had the great opportunity to attend the 10th Annual Hydration for Health Conference in Evian, France. 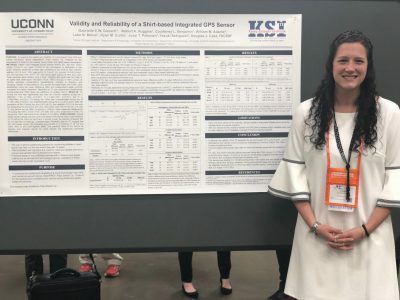 I was able to present research from a study done in collaboration with Dr. Lawrence Armstrong and Dr. Elaine Lee that investigated the role of fluid restriction on perceived sleep duration and quality. 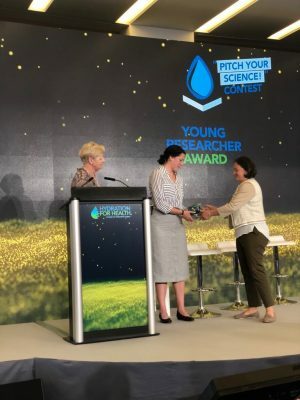 This research was presented as a part of the “Pitch Your Science” contest for the Young Researcher Award that consisted of a consolidated 3-minute presentation in a specific session of the conference. This conference is unique in that it unites several disciplines all with specific interest in hydration for health outcomes. 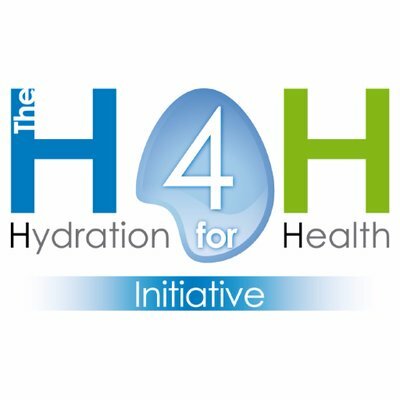 This conference provides a great opportunity for a variety of disciplines to discuss with international colleagues on the role of hydration on overall health. 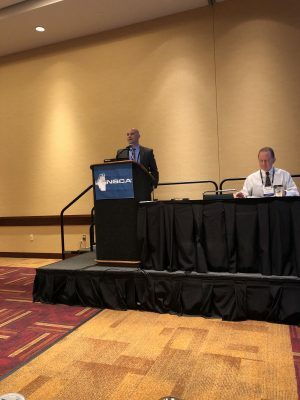 The 2018 NSCA National Conference was held in the beautiful city of Indianapolis, Indiana- home to the NCAA and ACSM headquarters. 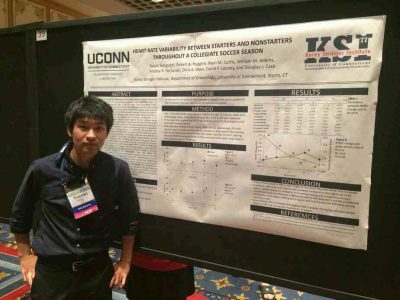 Members of KSI had the great opportunity to present some of our research during this July conference. 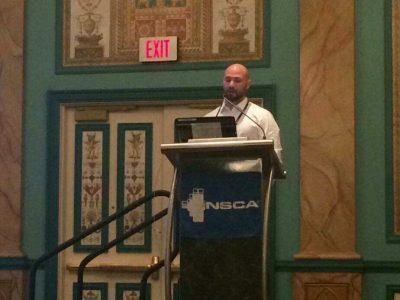 I was also awarded the opportunity to give a featured presentation titled, “What S&C coaches need to know to prevent sudden death in sports.” During this talk, I reviewed the 2012 best practices document related to collegiate strength and conditioning as well as discussed how this profession can continue to advance by ensuring the safety of athletes. 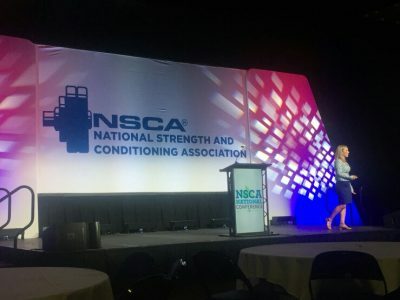 This talk could not have come at a better time as the NSCA president, Dr. Greg Hoff would announce exciting changes surrounding requirements for obtaining a CSCS certification at the opening ceremonies. According to an article released by the NSCA on July 12th, 2018 the certification process will change as follows. Effective target date 2030, all CSCS exam candidates must hold a Bachelor’s degree in a strength and conditioning related field, or be enrolled as a senior in such a program. Effective target date 2030, candidates will need to obtain those degrees from a college or university that has a program accredited by an NSCA-approved accrediting agency. This conference was a great opportunity to meet other professionals in this field as well as establish relationships for future collaborations. We look forward to attending this conference again next year! 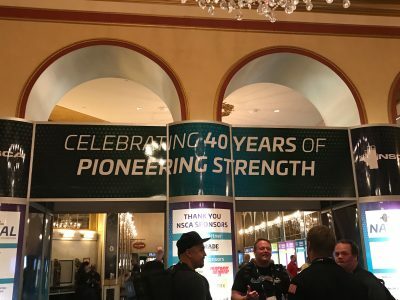 where strength and conditioning coaches, personal trainers, sport scientists, sport nutritionists, and health enthusiasts gathered to present, network, and honor certain outstanding members. 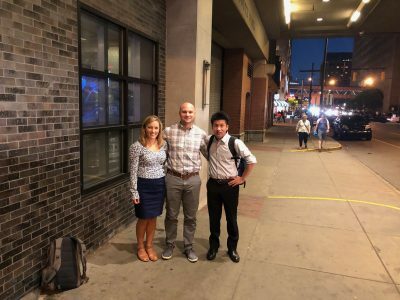 We were fortunate to attend a lecture given by this year’s Sport Scientists of the Year, Shawn M, Arent, and Dave DiFabio from Polar, whom we had the opportunity to work with in the past. They discussed the use of wearable technology and how coaches and sport scientists should start thinking about applying the knowledge we gather from this data to practice. 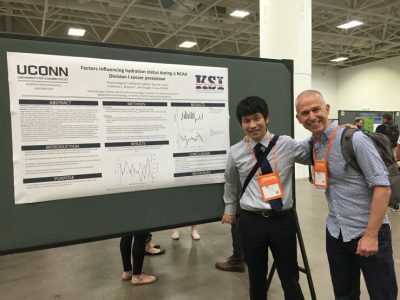 Ryan Curtis, Yasuki Sekiguchi, and I presented some of the recent research findings from the KSI. I presented a poster titled, “Analysis of Women’s Cross Country Lab Tests Results and Training Over the Course of a Competitive Fall Season” on Thursday (7/13/17). 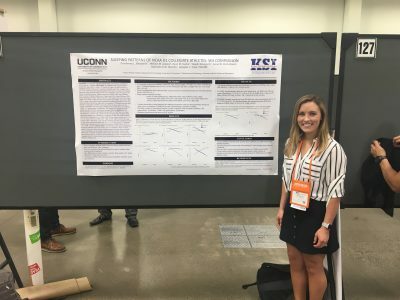 I examined the change in lactate testing, VO2 max and training of the UCONN Women’s Cross Country team during their fall season. The major finding of this study was the vOBLA (velocity at onset of blood lactate) was significantly higher during the middle of the season while VO2 max did not change throughout the season. 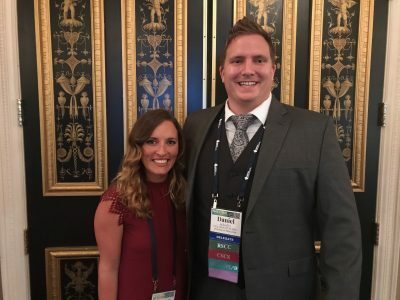 During my presentation, I was very excited to reconnect with two of my former colleagues from Florida State University. 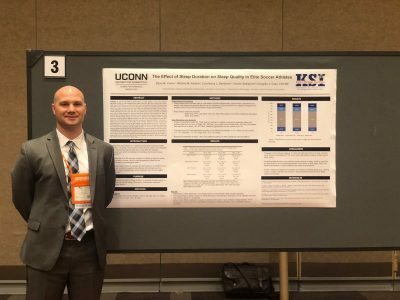 Daniel Shaefer was the former director of strength and conditioning at FSU and is now working on is PhD at the University of Wisconsin-Madison. Jon Jost was the former FSU director of strength and conditioning and recently accepted a position with Gatorade. I am hopeful that we will get an opportunity to collaborate on future research. I also had the fortune to meet Kristen Holmes-Winn, from WHOOP, who funded the research Ryan and I presented at this conference. Ryan Curtis did an oral presentation on Saturday (7/15/17) titled “Relationship between Sleep, Training Load and Fitness in Collegiate Soccer.” Overall this study illustrated that sleep quality may be more sensitive to increased training load than sleep quantity. Collegiate athletes with increased training loads have increased light sleep but not REM sleep or overall sleep duration. 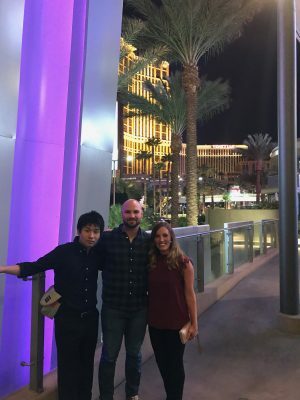 Outside of the conference, we had a fantastic time exploring the Las Vegas strip and the beautiful hotel hosting us and the conference, Paris Las Vegas. I am extremely thankful to the NSCA and KSI for the opportunity to collaborate and learn from others in the field while making memories that will last a lifetime. I look forward to attending this event next year and present the results from our upcoming projects.